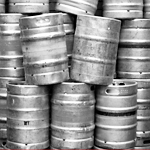 At a time of high global demand for metal, stealing kegs for scrap has become a lucrative trade. According to the IBA’s Thomas Burke, the cost of replacing a keg is approximately €100. “Metal theft has emerged as a worrying issue since 2007, costing the Irish economy millions of euro every year. For the brewing sector, keg theft continues to be a serious problem and is hindering our ability to meet customer requirements by creating unsustainable losses,” Mr Burke said. “For every keg stolen the cost of providing beer and cider to publicans in this country increases and damages the profitability of breweries. We believe that it is in our shared interest to protect our industry from keg theft”. To find out more, read the full article on the Irish Times website. GPS plastic kegs being made from HDPE means there is no scrap value, whilst still being 100% recyclable. Being approximately 25% lighter than steel will also mean you will save transport costs, whilst increasing payload. Tested to industry standards set by steel, the following video shows how robust our kegs and casks really are.